I did not really like this TF-5, so I was quite happy to leave it behind at Icod de los Vinos, and continue with a very fast descent on TF-42 towards the west, with much less traffic. 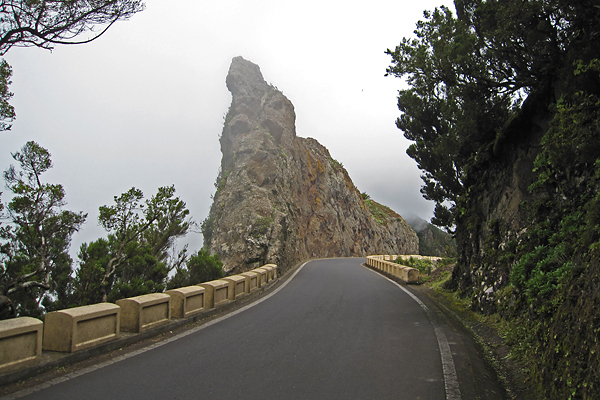 There is a very nice view towards the mountain ridges of Teno and the rocky shoreline of the island from this part of the road. 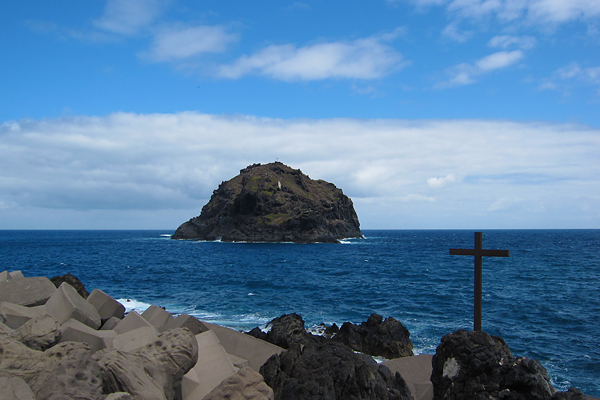 Soon the road arrives to Garachico, a lovely small city with colorful houses and a big rock in the sea in front. 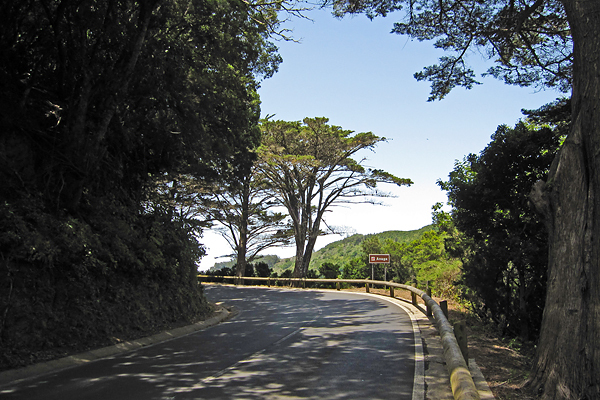 This was a very nice and scenic climb, on good asphalt, and with minor traffic. The switchbacks were usually very steep, while the sections in between were much easier (hence the not so high average gradient). 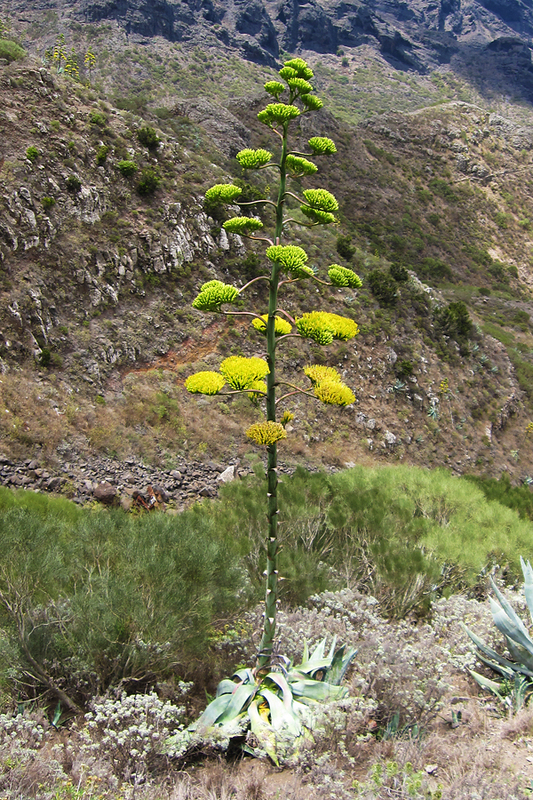 There were lots of typical high plants blooming along the road, and after El Palmar there was a very interesting (volcano looking) hill, with huge cracks along the sides – you can see that on the picture below. At the top, there was (a lot of wind, but besides that) a great lookout point with amazing views towards both sides of the ridge. This was the first very steep section (in the average, a 200 meter long slight descending section is also included), where I had to stand out of the saddle to get up. 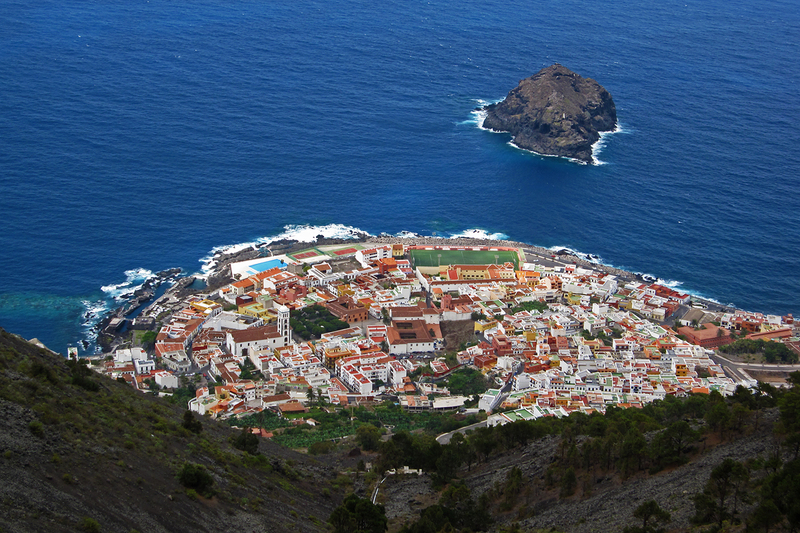 Then from the top, you could look towards the see along the steep valleys, but also towards the village of Masca. 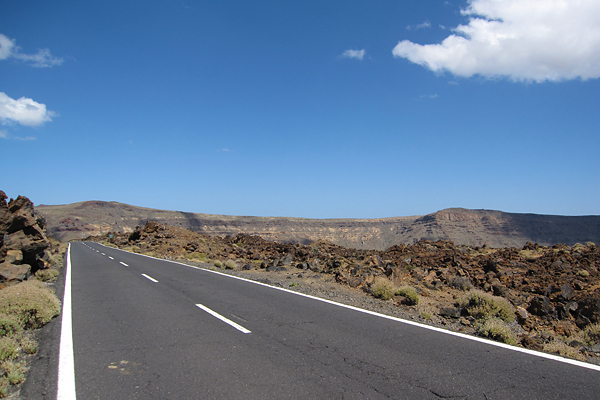 It was extremely difficult for several reasons: 1) the steepness itself, 2) it was the worst road surface I have ever encountered on the Canaries, I really would not want to do a descent there…, 3) it was in the middle of the day with the Sun near the zenit, in scorching hot with no wind at all… I had to be out of the saddle basically all the time, and I could have easily used an easier gear, than the easiest on my compact set… Even cars had difficulty in going up. But I did not stop (only at one of the last lookout points to take some pictures of the road and the view), I kept turning the cranks around (quite slowly, I have to admit). It was difficult, but it was also very good, to make it. On one of the steepest sections a car ‘slowed down’ next to me, and they asked if I was OK… I was, but I got it why they asked it :D It was damn steep and hot. 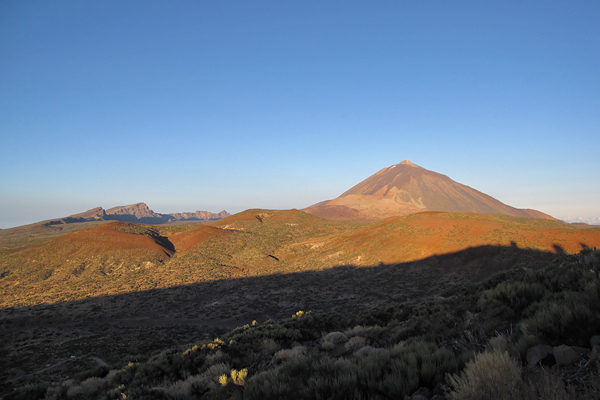 Then from the top you could see the Teide too! 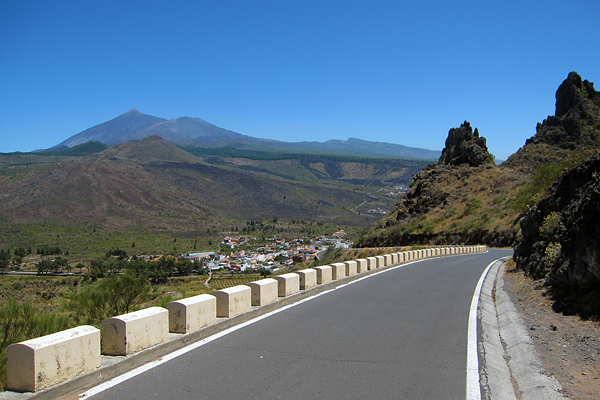 This was the last sunny stretch of road for my holidays, with nice views towards the western slopes of the Teide, but as soon as I passed the highest point (Puerto de Erjos, a bit higher than 1100 meters) I submerged into the cloud layer… From here, it was a nice, mostly smooth, long descent towards Icod de los Vinos. The steepest section was painful, but it was in the middle of a quite big city, so I got a quite big crowd looking at me :D Relatively big… Then from the top, it was just a roll home. I arrived tired, but happy about all the rides I did recently. GPS details from the last day can be seen here. 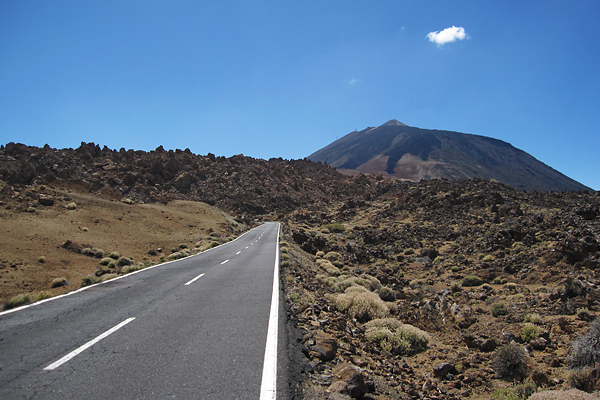 This entry was posted in Uncategorized and tagged bicikli, cycling, english, phdinleuven, tenerife on August 31, 2011 by Péter I. Pápics. After the ride of Thursday I had to take a day off (the bike). I walked around for a while in La Orotava (I will post some pictures of the city later), had a pizza for lunch, watched the Vuelta, and did not do anything special. Then on Saturday, I went cycling again. 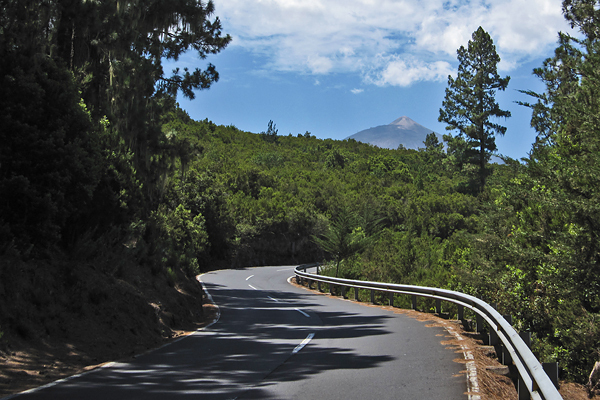 Now I was not in the mood to go and discover unknown roads, so I decided to ride up to the Teide, which I already did from this side last year. 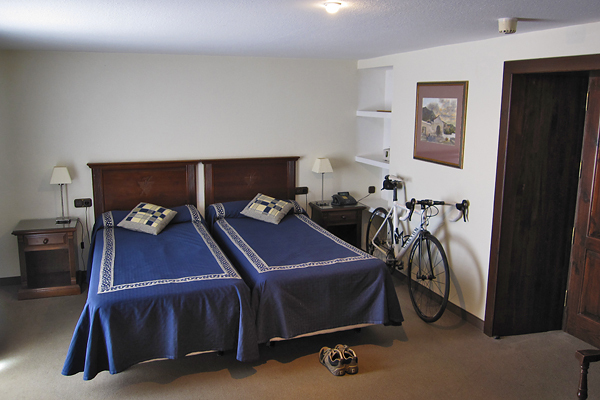 It was a very safe choice, because if I had any pain in my knee, I could have just turned back to roll down to my hotel. Of course, to properly climb the Teide (btw, it is not really climbing the Teide itself, because there is no paved road going all the way to the top, but it is cycling up to the highest paved road near the Teide…) first you have to go down to sea level – which means Puerto de la Cruz on this side of the island. 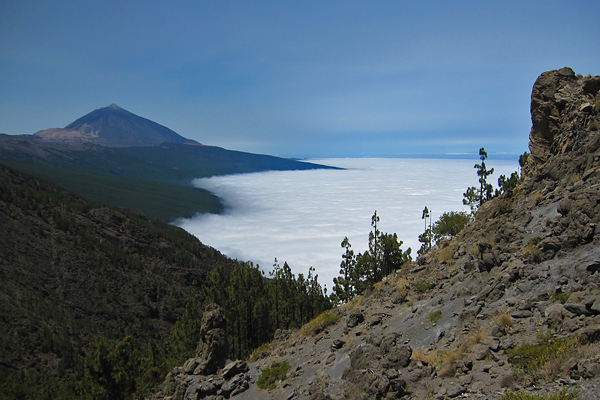 The Teide is visible from several places, luckily the highest point of the road is still one and a half kilometer lower than the peak itself… But it is a nice sight for sure, especially with the ocean of clouds below. Now I made sure that I eat often and drink enough to avoid the situation I got into on my last ride on Thursday. This worked very well, I felt still quite well when I reached 2000 m ASL. 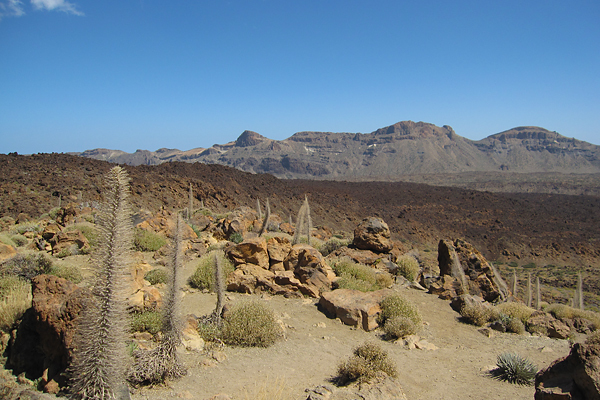 After passing El Portillo – the gate to the caldera – there were no more trees left, only rocks (and some small bushes, I know). And although the air temperature was around 20°C, it felt like 35°C with the strong sunshine and the reflection from the road and the rocks. From here I still rode (down and then a short climb up) to the base station of the cable car, to have a short break there in the shadow of the building, before I start my looooong descent back to my hotel. I managed to pass three out of the four cars one by one, and I was just about to pass the last one too, when we entered the cloud layer, but as the visibility was really bad, I decided to stay behind… It is better to have a car driving in front in such conditions, because they need more time to react on curves, so basically they enable you to ‘feel’ a longer stretch of road ahead. And cars have front lights, and I did not have one… I made it back to the hotel with minor fatigue, so I was quite happy with the ride. Still, I took another rest day on the next day :) GPS details can be found here. 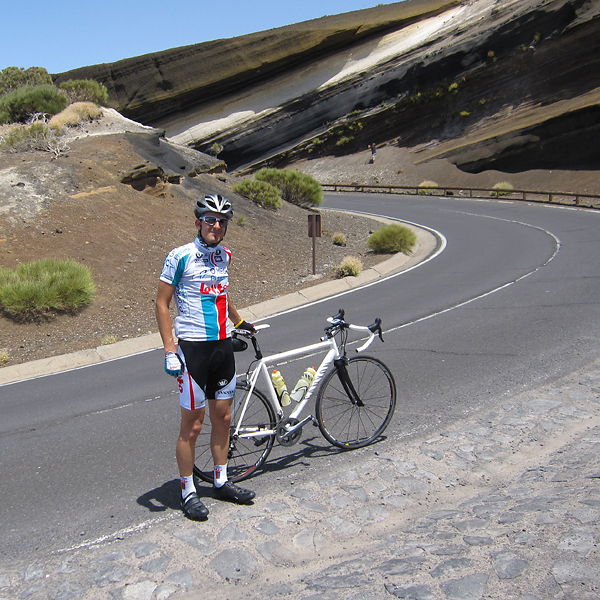 This entry was posted in Uncategorized and tagged bicikli, cycling, english, phdinleuven, tenerife on August 29, 2011 by Péter I. Pápics. 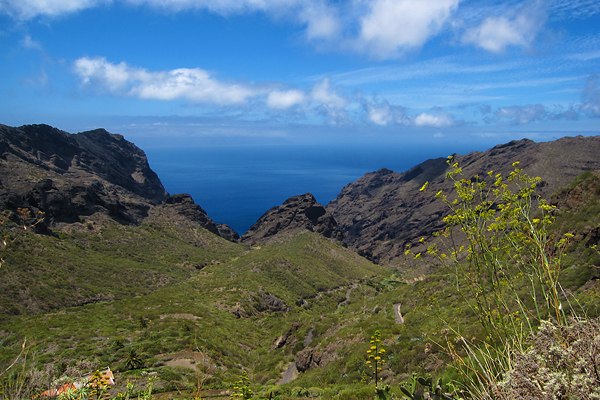 This was the ascent up to the top of the Anaga mountains, which is the oldest part of Tenerife. 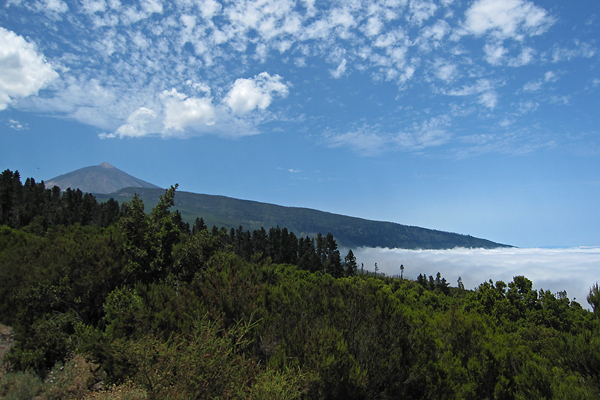 And also one of the most humid parts (along with the Orotava valley). There are almost always clouds above the northern part of the mountain range, and right after these clouds roll over the ridge, they disappear. But parts of the ridge are always in the cloud layer, with strong winds blowing from the north. 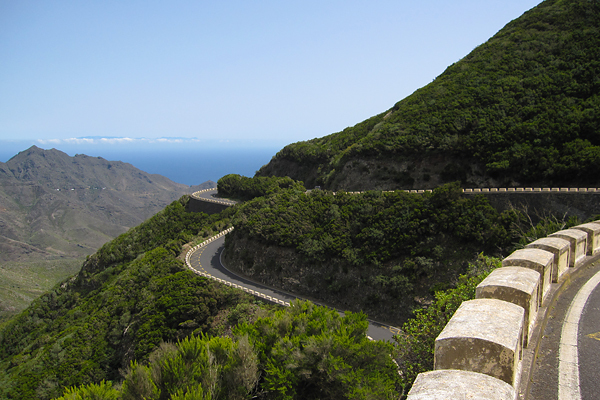 The ascent is long, but not too steep, with really good road quality and nice views. 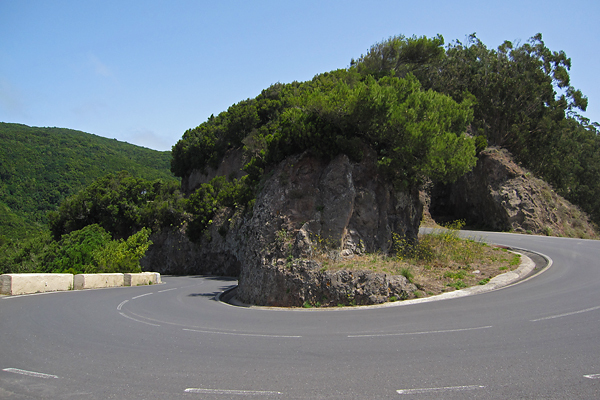 And some amazing switchbacks (here an excited family asked me if I was a professional, and then they were completely amazed when I said no – I still had some power in my legs at that point :D)! 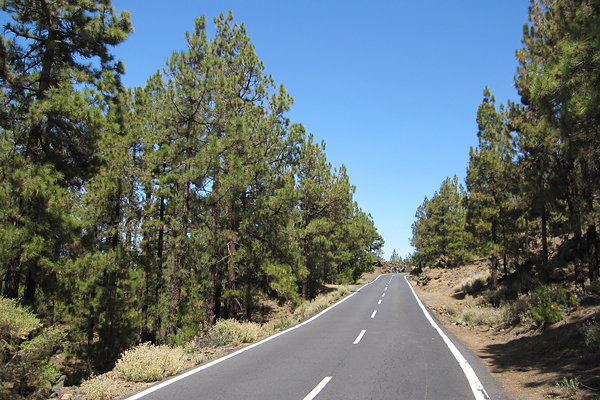 I was really happy that the road went through the forest, because the first part of the climb after leaving Tejina was extremely hot, and I did not feel too good about that… I think my biggest problem this week was/is cycling in the heat. I can not handle that too easily. I never had problem with humidity, rain, wind, but I have difficulties in extreme temperatures. 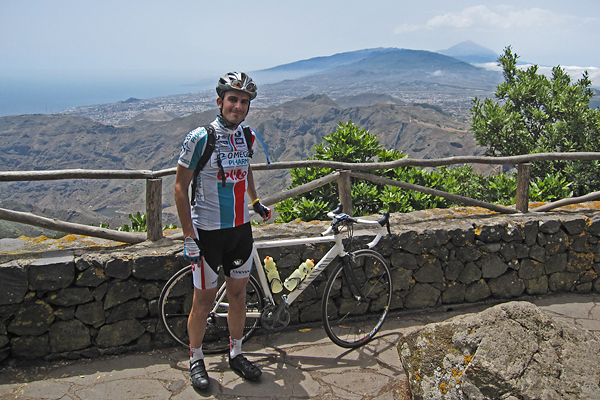 After reaching the top of the 1st category climb, I left the main road for a quick visit to the Pico del Inglés, to enjoy one of the best views towards the island from there (the lights would have be better on the morning, I know). After I left from here, the road disappeared into the cloud layer during the descent (with some ascending sections to break the monotony), and the temperature dropped significantly. As expected, it got pretty windy too. Then after 3.5 kilometers of up and down, the real descent started, with the same smooth asphalt as on the ascent, so it was a pleasure to roll down there. The road is only 1-1.5 lanes wide with more space in the curves, but the traffic is negligible, so it is not a problem. 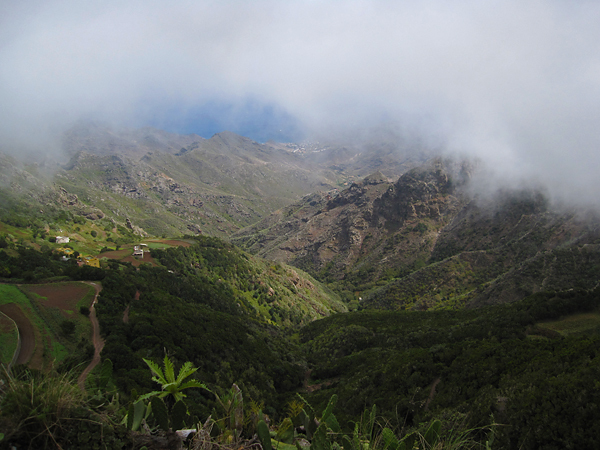 Then going further away from the ridge you leave the clods, and encounter one of the best views of the island. It is really hard to stay concentrated on the road, and still enjoy the scenery around you. I saw a mountain biker at approximately a minute or a bit more ahead, so I though I might try to catch him. Unluckily the headwind was really terrible, and I started to feel some pain in my right knee, so I had to slow down a bit – or risk getting an injury… As I did not want to go home in a taxi, I slowed down (and felt the shame for not being able to catch him). I really struggled on this section, the slope was only 6%, but the wind made it much more difficult. Luckily I got some rest when the road turned around in one of the many switchbacks, but it did not last long, as the main direction was still against the mountain, and the wind was blowing downwards along the slopes. Still, the view was amazing. I have a video from this road, check out the first five minutes here. I even had to stop once before reaching the top, because the wind was blowing just too strong. Then I arrived to the top and entered the cloud layer again. 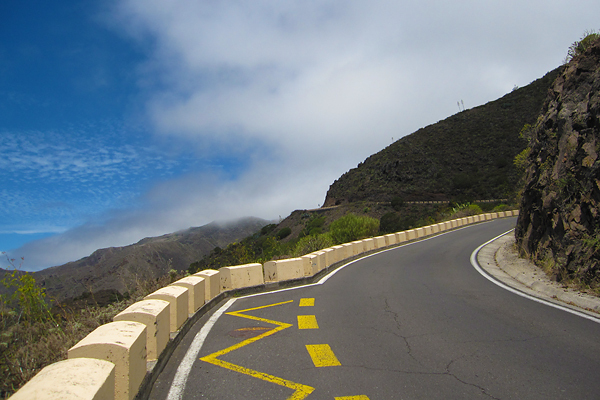 This road brought me over the TF-5 motorway, and then the rest was basically a continuous slight descent, except for two short sections before and in La Orotava. I had to make a last effort to climb up a very steep cobblestoned road just before my hotel (so I felt like in Belgium), but then I was very happy to get off the bike. I felt completely empty. I should have eaten much more in the first four hours, because having 6 categorized climbs is tiring even with proper nutrition… From this post it might seem that I only remember the hard things from this day, but I have to assure you that it was a very beautiful ride, and I am happy that I made it ;) GPS details can be found here. This entry was posted in Uncategorized and tagged bicikli, cycling, english, phdinleuven, tenerife on August 28, 2011 by Péter I. Pápics. Today after I approved the buffet breakfast of the hotel, I left for the first longer ride. I did not leave too early, only after 10 AM, because I knew it would be more than enough. The weather was normal, cloud layer at around 800-1000 meters, so not sunny, but humid and warm. I had downloaded my plans for the day to my Garmin Edge 500 cycling GPS, so I did not need a map, I only had to follow the track displayed on the screen. This was extremely useful (and stressful too – but I will talk about that later), because La Orotava is full of one way streets, and finding the way out from here is not that easy. 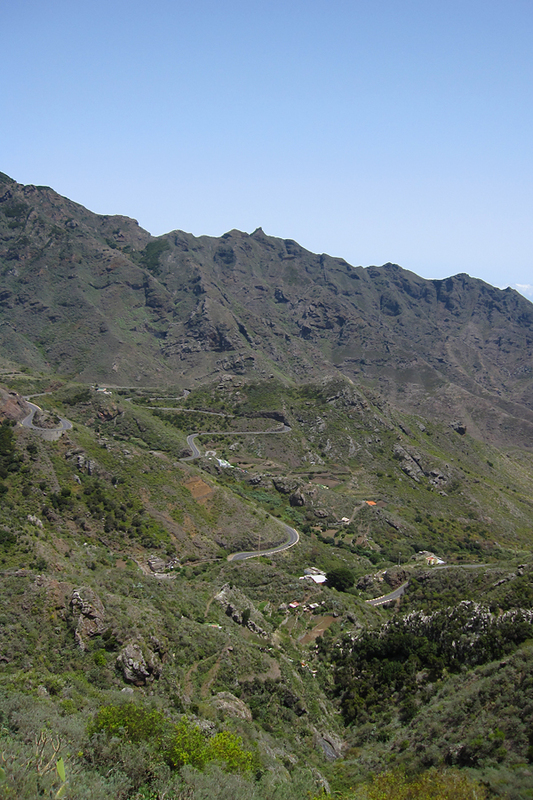 Also, cycling along the North coast of Tenerife to the East from La Orotava is not that easy when you have to leave out the TF-5 highway from your plans, because there are not that many roads besides that one. 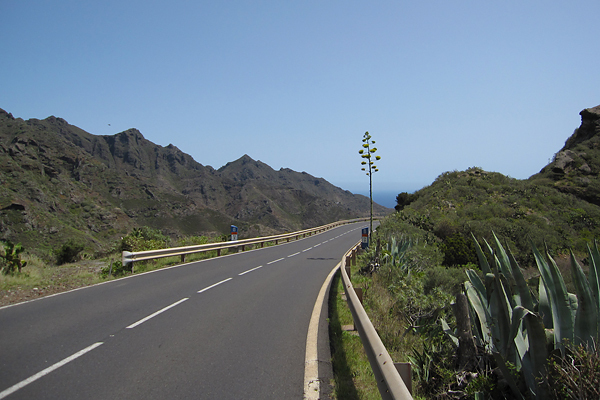 I took the TF-21 and TF-217 roads (with slight ups and downs, but nothing very serious), then after crossing above the highway, I rode to El Sauzal. Here after a short downhill, the first ascent started at the 16.79 km mark. The average gradient does not tell the whole story, because there were long and painful sections above 10%, but the rest was not that difficult. Still, it did hurt. Meanwhile the Sun appeared from behind the clouds, so it started to became a bit too hot too. 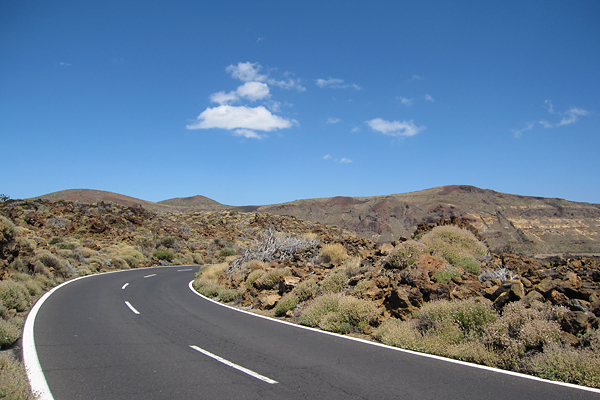 Then from the top, there was still a bit of rolling terrain, but soon the descent started to La Laguna on the TF-152 road. 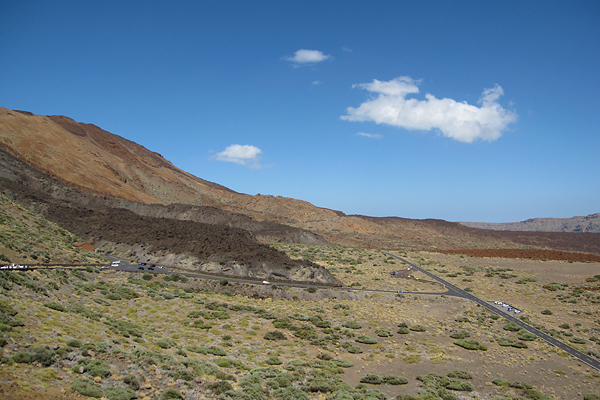 I did not spend any time in the city (I did that last November already), but I turned directly towards the Teide instead. After a quick bite (from my energy bars), I started the long ascent towards the Las Cañadas caldera at the 32.87 kilometer mark on TF-24. Again, don’t let the average gradient fool you, because there are even downhill sections included in this number! The typical gradient from the elevation plot is around 5-6%, when you only look at the uphill sections. 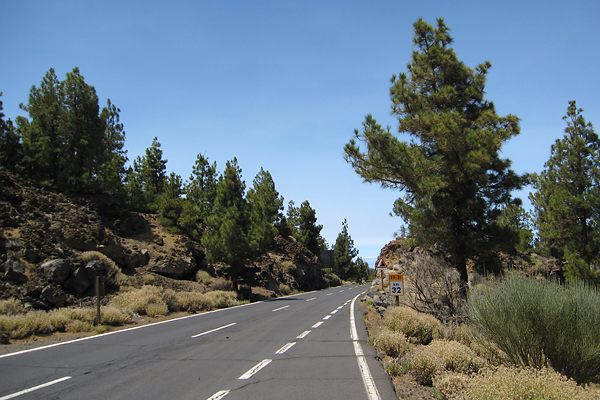 But on top of the length, and the constantly changing steepness, the main difficulty was the temperature above 1900 meters, where the road leaves the beautiful pine forest behind, and enters the rocky volcanic desert of the Teide. Also, this is the point where the road quality basically stops to exist, because while the asphalt is extremely smooth during the first half (it is a pleasure to ride there), it becomes cracked and worn for the second. But the view above the cloud layer is truly amazing. I could have taken hundreds of pictures, but I have already a lot from these islands, so now I only take a few for the blog, and try to concentrate on the biking itself instead. As I climbed higher the temperature also ‘climbed with me’ (my GPS showed 38°C, which was clearly not the real air temperature, but it felt like that), the Sun was shining extremely strong, so there were moments when I did not feel perfectly ok, even though I was riding with a zipped down jersey and I had enough liquids with me. It was very difficult during the last kilometers. 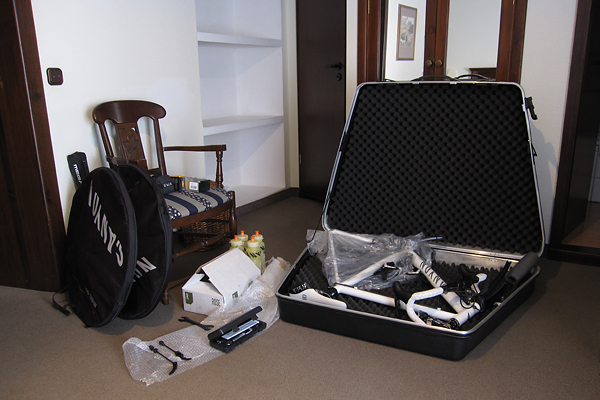 To make thing worse, around halfway into the ascent I realized that I forgot to pack my small toolkit and my small pump, so from that point I made sure I don’t ride over anything sharp… Luckily I had no flat tire during the day (and now I have already prepared these for tomorrow). 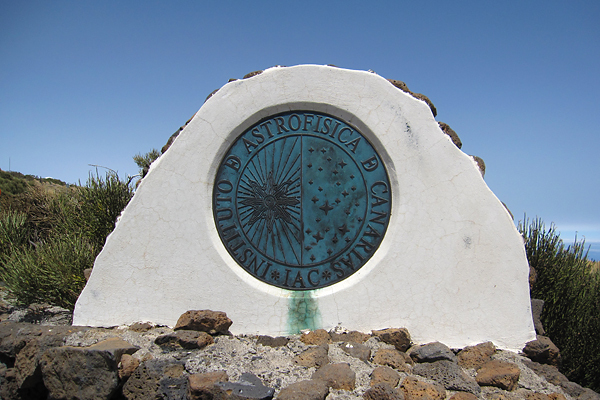 The highest point for today was the entrance gate of the Observatory! From here, it was basically a descent of more than 30 kilometers till home, which I enjoyed a lot of course, especially because the road quality was also quite good (TF-21). The temperature got much cooler when I entered the cloud layer, which felt really refreshing after the hours I spent riding in the scorching hot. This entry was posted in Uncategorized and tagged bicikli, cycling, english, phdinleuven, tenerife on August 25, 2011 by Péter I. Pápics. I still think that this is the best part of being an astronomer, but of course after so many days it is good to be back in the normal day-night rhythm, and on a lower altitude (almost sea level), where there is more oxygen ;) So after saying good bye to the view from the Observatory (see below – pretty, isn’t it? 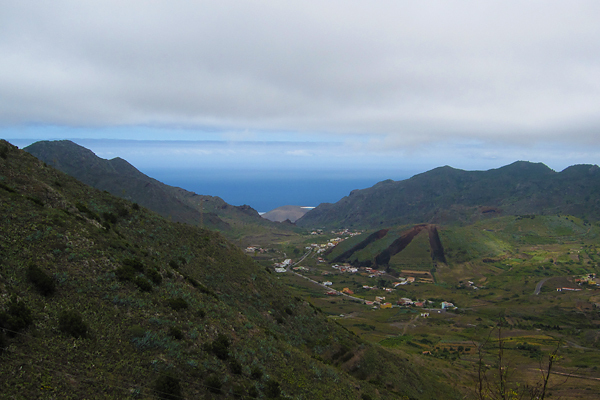 ), I took a taxi down (to 2000 meters lower in elevation) to La Orotava. 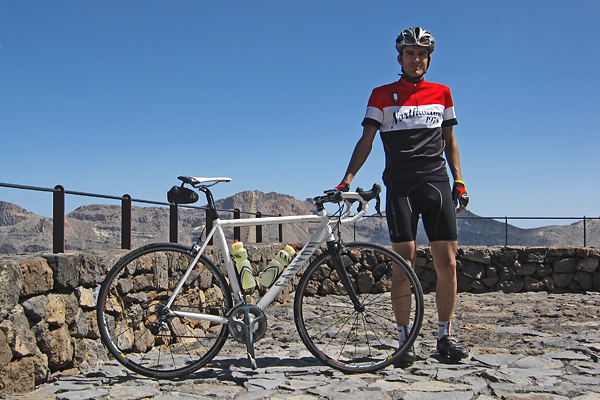 This entry was posted in Uncategorized and tagged bicikli, cycling, english, la palma, observing, phdinleuven, tenerife on August 24, 2011 by Péter I. Pápics.